You can purchase the map for $10.00 through our online shop or you’ll get a map free of charge if you join or renew your membership before the end of 2018. The 16-mile Loop Road offers a great opportunity to see the southern portion of the monument and includes pull-offs with scenic views. There are several short hikes from trailheads along the Loop Road. Allow approximately 2.5 hours to drive the loop and enjoy a few stops for sightseeing and even more time if you plan to hike. Click this link or the image below to view the full map online. You can also download the map as a .pdf. The map sections posted on this page are for viewing only — they are not designed to be printed from home computers. To request a physical printed copy of the map, please email us. A project of the Friends of Katahdin Woods and Waters, the Loop Road Interpretive Map is keyed to “stops” along the 16-mile Loop Road. The map features information about the historical, biological, and geological significance of the Katahdin Woods and Waters National Monument’s southern landscape. Recreation opportunities such as birding, biking and hiking are also highlighted. Access – The Loop Road is typically open to vehicle traffic beginning Memorial Day Weekend through the first weekend in November. 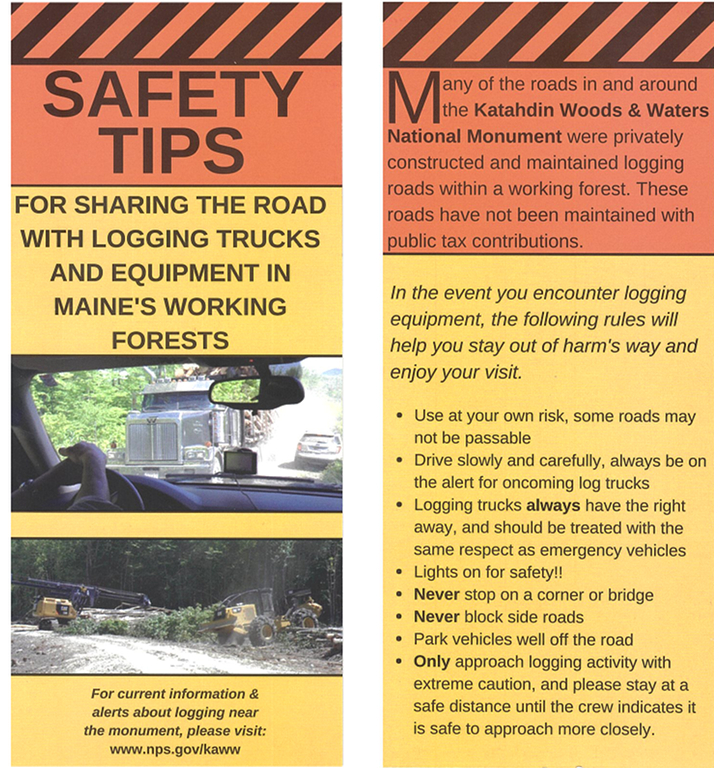 However, visitors should check the official Katahdin Woods and Waters National Monument National Park Service webpage for the latest updates as access is weather dependent. The Swift Brook and Loop Roads are gravel roads passable to passenger cars with normal clearance. Low clearance vehicles should exercise extreme caution. Be advised that this is a new national monument. Amenities are limited and signage is sparse. Cell phone reception can be spotty or non-existent. There are no services or concessions within the Monument. Advisory – Please use extreme caution when traveling on the Swift Brook Road and the Loop Road. These gravel roads are shared with logging and equipment trucks. It is important to drive slowly, keep to the right side of the road, and yield to oncoming trucks. Click this link or the image below to view the full National Park Service Recreation map online. You can also download the map as a .pdf. Click this link or the image below to view the full National Park Service Cross Country map online. You can also download the map as a .pdf. Take note that because of storm debris, the K Comp Rd and Stair Falls trail are not presently groomed in 2019. Click this link or the image below to view the full Snowshoe River Trail map. You can also download the map as a .pdf. This seasonal trail was flagged through the woods by Katahdin Woods and Waters National Monument Volunteers. Cartography was done by Friends of Katahdin Woods and Waters.